During Game 3 of the Clipper’s series against the Utah Jazz, Blake Griffin suffered an injury to his toe that would rule him out for the remainder of the playoffs. He recently underwent surgery to treat his injury, which was reported as an injury to the plantar plate of his big toe. This injury is also known as turf toe, and even though it may seem like a small injury it can greatly affect the ability to participate in sports, recreational activities and even walking. Turf toe typically refers to an injury to the big toe. The big toe is comprised of two bones, known as the distal and proximal phalange. The proximal phalange attaches to the metatarsal bone in the foot, forming the metatarsal phalangeal joint (MTP). Underneath the MTP is the plantar plate, a small sesamoid bone, and various ligaments and muscle attachments. Turf toe typically occurs when the first toe is hyperextended. In other words, when the toes are planted on the ground and the rest of the foot is lifting off the ground. This position places strain on the bottom of the MTP joint, causing damage to the plantar plate and surrounding structures. This injury occurs commonly on turf due to the harder surface, which can cause the toes to be stuck in place. The symptoms of turf toe include pain, tenderness, bruising, stiffness and swelling at the joint. Parents should watch for avoidance behaviors and painful gait patterns in their children. Recovery time depends on the grade of the sprain, and in the case of complete tears surgery may be necessary. For any turf toe injury, rest is required in order to allow for healing. Bracing, splinting and taping are often used for weight bearing tolerance so it is important to prevent adhesions in the injured structures. Passive ROM can be initiated within a few days of Grade I and II injuries along with non-impact activities. Grade III injuries require immobilization but even if surgery is needed, ROM can be performed at 5-7 days post op. Make sure to see a PT and find out what you can be doing throughout all phases of recovery. Blog Post written by Meggie Morley, DPT. At the time of posting Meggie was in her final clinical rotation with me at Catz Physical Therapy Institute. 2. McCormick JJ, Anderson RB. 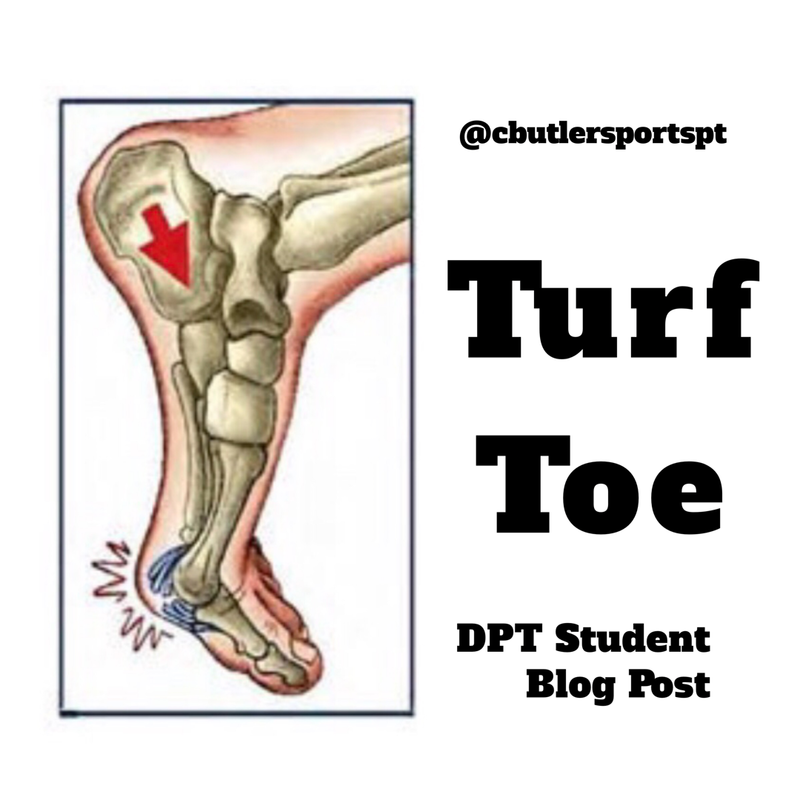 Turf toe: anatomy, diagnosis, and treatment. Sports Health. 2010; 2(6):487–494.